This is our third year in a row presenting 50 Apps in 50 Minutes at the Texas Library Association's Annual Conference. If you missed our last two, you'll find them here and here. A note on pricing and availability: it’s been our experience that prices for apps change often, so if you like something that’s a bit out of your budget, keep an eye on it as sometimes the prices drop temporarily or even permanently. Love something that’s only an iThing? We saw several notes along the way indicating that an app’s owner listed Android, etc. as “coming soon”. So make a note of what you like and you may see it soon on other platforms. 1. Mr. Number Allows users to block calls from specific numbers. Will also identify/label business numbers. 2. Tile Locate anything you attach a Tile to using the Tile app. 3. Lasso Photo sharing app for smaller groups of friends. 4. Jifiti Browse your favorite stores and send a perfect gift instantly to your friends’ email, phone or Facebook page. They select the size, color and style, or choose anything else when redeeming in-store or online. 5. Forgotify Plays songs from Spotify that have never been played. 7. Seratis Care coordination tool that is a secure, patient-centric mobile application which enables doctors, nurses, and other healthcare providers to communicate with each other via text, images, and videos. 8. SmileDrive: Records your drives and keeps track of things like location, distance, time and weather. 9. ReSound Linx: Hearing aids that connect to your iPhone. 10. Punchh Virtual loyalty card. 11. Wello Cell phone case that will track your vitals including blood pressure, heart rate, temperature, etc. 12. Chorma Household chore manager. 13. Kolibree Toothbrush app which checks regularity, monitors brushing time and tracks missed spots. 14. Fixed Helps you fight parking tickets. 15. DocuSign Sign contracts, invoices, insurance forms and rental agreements. 16. SitOrSquat Search, view and rate bathrooms. 17. Puppy Lost dog tracker. 18. Doctoralia Find a doctor, great for travelers in international cities. Also allows you to schedule an appointment. 19. Tynker Games to help kids learn to code. 20. Smart Traveler Real time travel alerts from the U.S. State Department. 21. HiConverter All sorts of conversions: international sizes, currency, tips, cooking, etc. 22. Split Helps you avoid unwanted encounters. 23. A-CHESS Addiction-Comprehensive Health Enhancement Support System. Assists recovering alcoholics. 24. PayNearMe Allows customers to pay bills via cash at Family Dollar & 7-11 stores. 25. RoomScan Measures room dimensions. 27. Paper Facebook's new app. 28. BillGuard Financial app that alerts you do recurring or suspicious credit card charges. 29. Dashlane Generates and stores passwords. 30. Penultimate Evernote's handwriting app. 31. GAIN Fitness Provides exercises based on time and equipment available. 33. NoWait Restaurant hosting management app. 34. Cartwheel from Target Tag items in the store and a discount is applied at checkout. 35. Onavo Extend Compresses mobile data to save money on data plans. 36. Wickr Provides secure communications that Leave No Trace. 37. Jelly Q&A app using pictures, texts and drawing. 38. DollarBird Smart calendar for your finances. 39. QuizUp "The biggest trivia game in the world" Basically a Words with Friends style quiz game. 40. Cloze "Keep track of the people and posts that matter. Filter out the noise of everything else." 41. Timehop "What were you doing one year ago today?" 42. Wonder Timer Preset timers for common activities. 43. Newsbeat Personal news radio--reads print and online news. 44. Fitbit Wearable fitness tracker. 45. Spritz Speed reading app. 46. SignNow Sign documents anywhere. 47. Uber Private car service. 49. CloudGoo Connect all your cloud drives. 50. Printic "We print your memories." 12. SwiftKey Keyboard allows you to type without lifting your finger, predicts phrasing. $3.99 for Android. 13. Fleksy is free similar for iPhone. 15. Avast! Mobile Security Virus and theft protection. Free for Android. Lookout is similar for iPhone and is also free. 41. Starbucks Pay with you app, but they also have a new feature called "Pick of the Week" which gives away free items in the store such as apps, music or NYT articles. Free for iPhone & Android though currently, only iPhone has "Pick of the Week"
42. Wanderable Chip in on the happy couple's honeymoon. Couple can send easy thank you notes. Free app and website, and Wanderable takes 5% of the amount. 48. Concert Vault "In 2003, Wolfgang’s Vault acquired master recordings from the archives of Bill Graham Presents. These live concerts were recorded at legendary venues like the Fillmore East and Winterland between 1965 and 1999. Since then we’ve acquired over a dozen more collections - some large, some small, all of them compelling, spanning a wide spectrum of musical genres." $3.99 a month for iPad, iPhone & Android. 50. Mango Tracks prescriptions and vitamins with reminders and records. Free for iPhone with Android Coming Soon. The tests I ran on all of these programs yielded the same results. However, there were some features that distinguished the good from the bad—namely the number of addresses you can validate in one sitting. Tools like these are incredibly useful for librarians, CI analysts, sales people, or anyone else who wants to reach out to an expert, potential client, or anyone with whom they are not immediately connected. I suggest keeping verifyemailaddress.org in your back pocket, should the need to figure out someone’s email address ever arise. It's everyone's favorite time of year. Political campaign ads 24/7. Oh, it's not your favorite time of year? Wondering how much of what you hear on these ads is true? (Hint: Probably not much.) Time to download the Super PAC app. When an ad starts "a user can hold up her phone to identify the commercial and receive objective, third-party information. The Super PAC App allows the user to rate the ad, while understanding who and how much money is behind the ad, what claims the ad is making, and whether those claims are based on facts." Ah, facts. Refreshing. The app is free and currently available for iPhone. Check out the video to learn more about the Super PAC app. 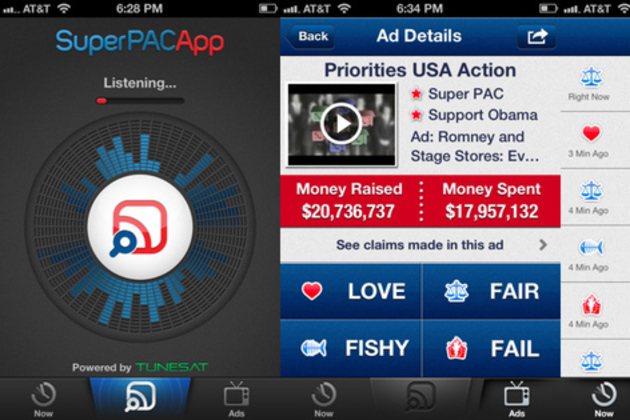 Introducing... Super PAC App from superpacapp on Vimeo. 11. ColorSmart by BEHR™ Mobile "is an easy and convenient way to find, coordinate or preview a BEHR® paint color for all of your paint projects." 20. Google Goggles “Search by taking a picture. Goggles uses image recognition technology to recognize objects and return relevant search results. Identifies products, famous landmarks, storefronts, artwork, and popular images found online. “ iPhone & Android, free. We hope some of our readers will be joining us at the Texas Library Association's Annual Conference in Houston. We bizologie girls along with the Special Libraries Division of TLA will be presenting several sessions and we'd love to see you in the audience. Below you'll find descriptions and times for each program. Check back the week of the conference and we'll have our presentations posted here along with links to all the tools, apps and resources discussed at TLA. Hope to see you there! Sometimes you actually get more than you pay for! Get links to 20+ free sites with business information covering marketing, energy, demographics, technology, and more. Two career services directors discuss ways job seekers can expand their resumés to appeal to a broader audience of hiring managers in and out of libraries. Find out the practices to use and avoid during interviews. We’ll introduce 50 apps – some for business and some for fun. All platforms, including Android and iPad will be discussed. Join us for a lively, fast-paced and fun presentation. Salary Negotiation: Yes You Can! A panel of librarians offers an open Q&A with attendees. Panelists will share how they moved from libraries into new positions outside libraries. Find out what worked for them. Find new ways to use social media tools to gather current information about companies at no cost. Learn to show your customers how to use LinkedIn, Twitter, and FaceBook for competitive intelligence. One of our new favorite apps is EasyBib. If only it had been around when we were in grad school! EasyBib allows users to "create accurate MLA, APA, and Chicago style citations in seconds by scanning a book bar code or by typing the name of a book." Once you've scanned your book, you can either email it to yourself or upload it to EasyBib's bibliography management site. EasyBib works with iPhone, iPod Touch and iPad, though their notes say it works best with iPhone 4. EasyBib is available free in the AppStore. If there are two things I love, it's Christmas, Charlie Brown and technology. Wait, that's three things. Just in time for the holidays, Loud Crow Interactive brings us this wonderful iPad app featuring "A Charlie Brown Christmas". It's a digital book featuring narration by Peter Robbins, the original voice of Charlie Brown. 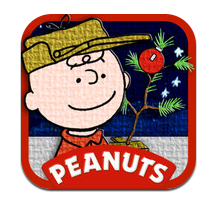 The app lets you decorate your own Charlie Brown Christmas tree, participate in the lights and display contest and features music and sound effects from the original television special. It's available in the App Store for $6.99. And judging by the promotional video, it looks like it just may be worth the money. On Friday, October 28th, the Texas Chapter of Special Library Association will present "Speed Dating with Technology Tools & Applications". Librarians from varying backgrounds (Oil & Gas, Law, Art, Business, Venture Capital, Journalism) will present a wide range of databases, web tools and apps. We hope to see you there, but just in case, below you'll find a list of our presentations as well as web links to the apps, websites, etc. Energy Industry Intelligence on the Go!--Energy industry intelligence on the go! Oil Daily, Natural Gas Week, Petroleum Intelligence Weekly and 11 other newsletters now available via our iPhone/iPad application. Presented by Betsy Harris from Energy Intelligence. SharePoint Options to Improve Access to the Library--Using SharePoint to create Information Centers for Library Products and Legal Practices. Presented by Terri L. Lawrence from Winstead. Mailtester Web Tool--Mailtester allows users to confirm email addresses. Mailtester is perfect for helping track down addresses for CEOs or other company executives. Presented by Laura Young from Austin Ventures. Storing Documents--DocumentCloud is a Web-based tool for cataloging, annotating and sharing documents. Originally designed for journalists, it has excellent privacy settings and also excellent tools for publishing documents publicly. DocumentCloud provides a free service for journalistic organizations, but the DocumentCloud server software will be released free once the project is complete. Presented by Daniel Lathrop from the Dallas Morning News. Shortcuts for the iPhone--Learn shortcuts for creating webclips, how to move icons, organize home folders, use voice control, and more! Presented by Barbara Fullerton from Morningstar, Inc.
Foodtimeline.org is a great source for tracking food prices throughout American history. 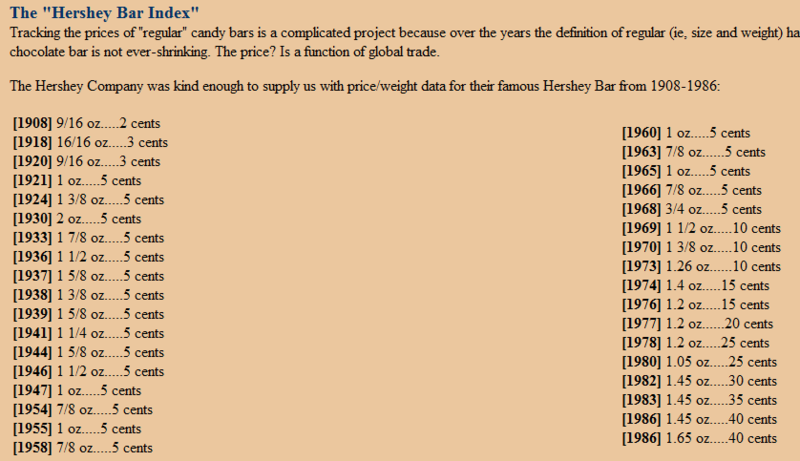 They've got great lists like "The Hershey Bar Index" and historical prices of McDonald's Hamburgers. In 1955 a Hershey bar was just 5¢ and a McDonald's hamburger was 15¢. But what if instead of spending your 20¢ on candy and burgers, you had invested it in 1955? Well, there's an app for that, of course. MeasuringWorth.com has an app called The Time Traveler's Investment Calculator. "The Time Traveler’s Investment Calculator is a simple way to go back in time and choose a hypothetical investment strategy and see how you would have done. You can compare your actual investments with what you wish you had done." But if apps aren't your thing and you want to kick it old school, check out The Value of A Dollar: Prices and Incomes in the United States. This is a great resource for historical products and services dating back to 1860 and is almost always found in your local public library's reference section. Shoppers and Tech Lovers rejoice! Today Google has launched their Google Catalogs app which allows you to browse all your favorite catalogs in one spot. I'm really excited to see this service as I recently downloaded the new Ikea catalog to my iPad and it's great to flip through and keeps my counters clear of catalog clutter. Google Catalogs has already partnered with several of our favorite stores including: Anthropologie, CB2, West Elm, Crate & Barrel, Nordstrom, Sephora and many more. And while it's obviously convenient to flip through your favorite catalogs without waiting on the mail, they've incorporated some pretty cool features. There are features you'd expect like the ability to zoom in on products and connect to the website or find them at local stores. But then there are some really cool features like being able to take the products you like all from different catalogs and create a collage of your favorites. You can share your collage with friends or check out collages other people have created. I think this is a great feature, especially if you're looking for design inspiration for your house. You can also search for particular products across all catalogs. Once you've added a catalog to your favorites, you'll be notified every time a new one comes out. So on the one hand, Google Catalog is "green" which is nice, but also dangerous for our pocketbooks! Having been in a meeting today where yet another phone rang, I was very happy to see this app for the Android. 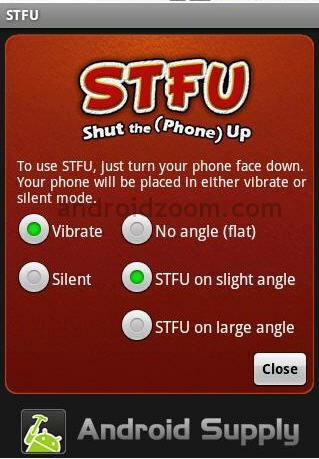 STFU - that is Shut the Phone Up - makes it easy to silence that cell phone. Just turn your phone upside down and it is immediately set for either silent or vibrate (your choice). STFU is just 99¢ and worth every penny. You pay a little more for the cute name. RD Mute is a similar tool available for free. Now I've taken care of my phone, what about the guy next to me? One of our new favorite apps is Flex Search from Dynotes Mobile Technology. Flex Search combines all the places you like to search all in one place. You can search Google, Bing, Yahoo, Wikipedia, Wolfram-Alpha, YouTube, Flicker, Twitter, LinkedIn and Facebook all without switching between different apps on your phone. You can also search images and Webster's Dictionary & Thesaurus from inside the same app. Once you've got your results, you can even share it directly from the app to Twitter or Facebook. Flex Search is available free in the iTunes AppStore. March 24, 2011. Dear Diary, we've got a new favorite app. Actually, the diary app Momento is one of our new favorite apps. Momento starts out just like you'd use an old fashioned diary: log the date and start writing about that cute boy in math class. But the great part is that Momento lets you import feeds from all of your social networking sites and then organizes them by date. You simply add your Facebook, Twitter, Flickr, Instagram, Foursquare and Gowalla accounts and suddenly you've got an automatic record of each day and you didn't have to write a thing. From there you can search by dates or tags or events and reminisce about special dates in your life. You might see that on February 27th you checked in on Gowalla at the coffee shop, uploaded a picture of your BFF to Flickr and attended a fabulous Oscar Party. Momento also allows you to lockdown the app so that you don't catch your little brother snooping through your diary. Momento is available on iTunes for $2.99 and the company is considering expanding to Android. XOXO, bizologie. Word Lens--Translates signs from Spanish to English (and vice versa). Simply open the app and hold it up to the sign you want to translate. Check out the video below to see Word Lens in action. Available for iPhone only; Android is in the works. Free WiFi Finder--True to its name, this app helps you find WiFi locations all over the world indexing both free and paid hotspots. The best thing is that you can download the directory to use offline. Perfect for locating WiFi in international locations when you don't want to use that expensive international data plan. Available for iPhone & Android. Hear Planet--Audio guides of tourist destinations all over the world. Includes geolocation so you can hear about what's nearby. Requires a data connection so probably not a good choice for international travel. Available for iPhone & Android. HopStop--Public transportation and walking directions for several big cities with more on the way. I've been using this one for years when I travel to NYC for instant subway directions. Available for iPhone & Android. Frommer's Travel Tools--This is a nice little one-stop-shop app which includes a currency converter, a time translator, a packing list and a few other handy tools. Available for iPhone only. Siri--One of my all time favorite apps, Siri is like having your own personal assistant. Simply tell it what you're looking for (a taxi, some ice cream, a movie) and Siri does it for you. I've used this for calling a taxi in an unfamiliar city before. Siri knows your location, contacts the cab company and texts you the name of the driver. Before you know it, your cab has arrived and all you did was utter the word "taxi". Brilliant. Available for iPhone only. Simply Postcards--We've covered this one before, but it's worth repeating. Send any image as an actual postcard right from your phone. Snap your picture, enter a friend's address and let Simply Postcards do the mailing. Love it! Available for iPhone & Android. TripIt--Organizes all of your flight numbers and hotel reservations. I like that TripIt allows you to forward confirmation emails from airlines, etc. and then imports them easily into an itinerary. Available for iPhone & Android. GateGuru--Helps you locate airport restaurants, shops and other amenities not only by proximity but by reviews as well. Available for iPhone only. xe--Free mobile currency calculator. You can store the latest updated rates for offline use. Available for iPhone & Android. Google Translate--"Allowing users to speak to translate in 15 languages and to translate words and phrases into more than 50 languages. You can also listen to your translations spoken aloud in 23 different languages." Available for iPhone & Android. Trip Case--Organize your hotel, flight and car rentals all in one place. TripCase will also alert you to flight or gate changes and offer alternative flight choices if your flight is canceled or changed. Help Call--With 126 countries supported, Help Call gives you up-to-date international Police, Fire Department and Ambulance phone numbers. Available for iPhone only. FlightBoard--Arrivals and departures in real time. FlightBoard's design was "based on the flight board at Charles de Gaulle Airport to give the app a beautiful, old school look." Available for iPhone & Android. You know "there's an app for that". But how do you find it? Chomp is a new search engine just for apps. Instead of searching by app names you can search by app categories. If you're looking for games you can be really specific like "puzzle games" or "kids' games". Results are then displayed along with review ratings and one click takes you straight to the iTunes store. They've also got a great page full of "trending iPhone app topics". If you're looking for app stats, Chomp also produces "Chomp Charts" of usage trends, seasonal queries, app monetization and the "Chomp 55" which are the most downloaded and highest rated apps. "Chomp Charts" are in a nice slide show presentation that are free to download. Of course, Chomp has its own app so you can search right from your phone. Ever get that text that says "Let's all meet for pizza"? And then you're left wondering who is "all"? Am I the only one who responded "yes"? Will there be four people at this event or ten? Enter GroupMe. Problem solved. GroupMe offers group texting and conference calling. You simply create a group of friends or coworkers and GroupMe assigns each group a phone number. Whenever anyone in the group texts the phone number, everyone gets the message and can see all messages sent by other group members. I tried it for the first time today and it worked like a charm and was really easy. You can create as many groups as you like so it's perfect for things like family, softball teams, book clubs or your happy hour crew. They also offer a photo sharing feature inside the app so you can take a photo or choose one from your library to send to your group. When you use the conference calling feature, whenever anyone in the group calls the group number, everyone gets a call and anyone in the group can initiate it. Missed the call? No worries. GroupMe will send you a text saying the group is on a conference call and you can join in mid-conversation. You can have up to 25 people in a group. GroupMe is available free for iPhone and Android and the service itself is free although you'll still pay the regular texting fee from your service provider.